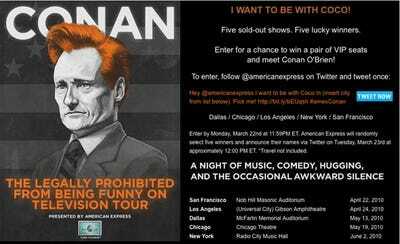 Dying to see Conan O’Brien’s touring stage show? Want to actually meet him backstage? You can do it! American Express is holding a contest on Twitter for the chance to win a pair of VIP seats. These are the cities you can choose from: Dallas (May 13), Chicago (May 19), Los Angeles (April 24), New York (June 2), San Francisco (April 22). You have to tweet by Monday, March 22 at 11:59 p.m. ET. American Express will randomly select five winners and announce their names via their Twitter account the next day at noon.